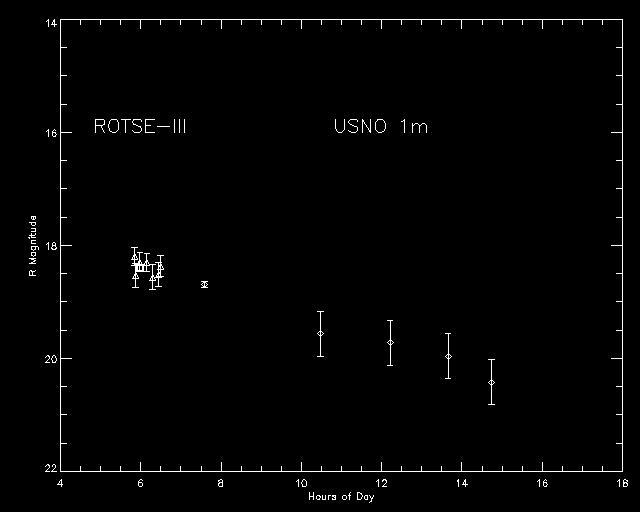 When the first position for this burst was distributed by HETE (at 24 Mar 03 02:55:11 UT, five hours after the burst), the source position was not yet high enough above the horizon for ROTSE-IIIb to image it. We began a sequence of ninety 60-second images at 5:47 UT (7.8 hours after the burst). Gilmore, Kilmartin & Henden (GCN Circ. 1949) report a possible optical counterpart that showed evidence of fading in later observations. We found evidence of seven marginal detections of this source among our ninety images, so we made four co-added frames with 20 images each. The source is clearly detected in the first of these frames at a magnitude of 18.4+-0.1. Visual inspection shows that the source is marginally detected in the other three frames, and we will be adding information to this web page as we continue working on it. The following graph shows the light curve combining both datasets. 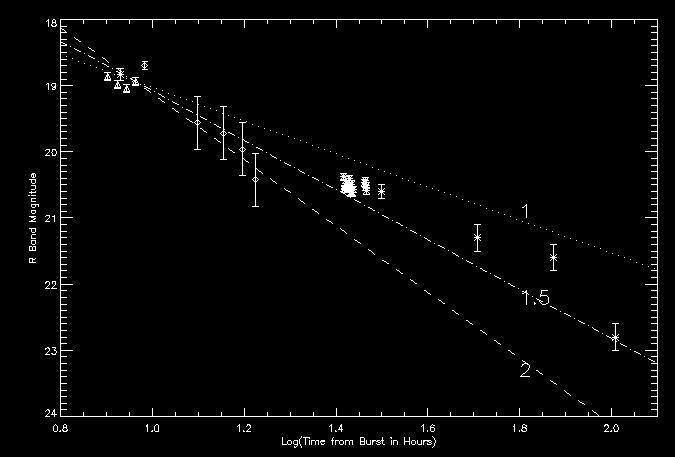 Measurements from Gilmore et al. are indicated as diamonds, while the individual detections from ROTSE-IIIb are shown as triangles. The thick square represents the detection in the first co-added frame. 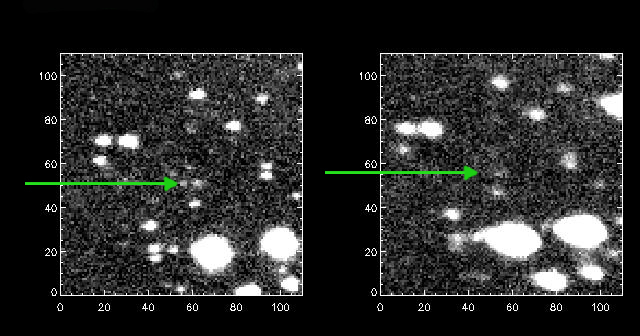 Here you see two examples of single 60-s images: one in which the source is clearly detected, and one in which it is not. The left image is the 20th image taken in the sequence, while the right image is the 60th. A gust of wind distorted the PSF in the latter image. North is down in these images. And here is the candidate as seen in the four co-added frames. The frames in time sequence order are: upper left, lower left, upper right, lower right. 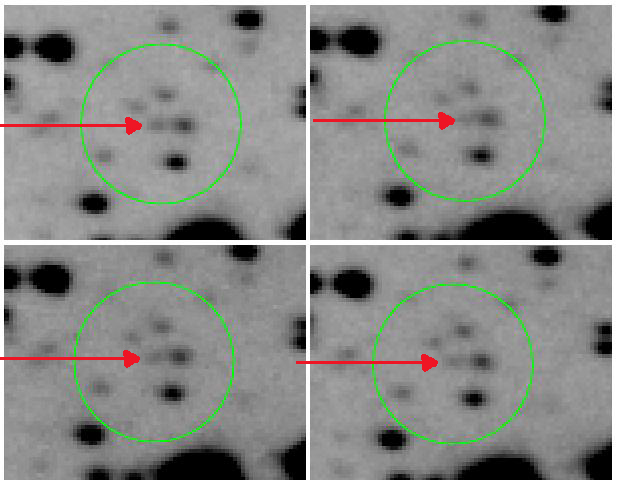 To measure the brightness of the candidate in these images, we performed an aperture calibration of the 12 nearest bright stars against the V-band photometry provided by Henden (GCN Circ. 1948). Below, we plot these data (as triangles) along with the later points on a log-log graph (with our points recalibrated to R band). The following graph shows three representative power laws, all normalized to our last data point. The magnitudes reported by Gilmore et al. are shown as diamonds. Other reports (GCN Circs. 1960, 1966, 1968, & 1973) are plotted as asterisks. The value of each decay index is printed over the line, in the lower right side of the graph.